Harry Potter and the Half-Blood Prince is set for box office battle July 15. One of its stars, Rupert Grint, is battling a monster of another kind — Swine Flu. 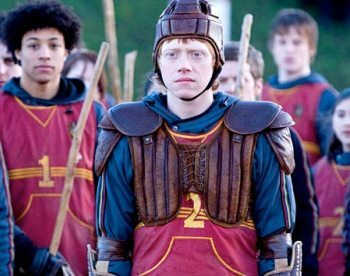 The 20-year-old Harry Potter star otherwise known as Ron Weasley is still at work on the final chapters of the Potter saga. Grint is recovering nicely, according to his publicist, and is no longer contagious. The actor missed a few days of filming, but as his publicist says, the Harry Potter production was never affected. “Scenes were shot in his absence which did not require his involvement and thus filming was not disrupted,” his publicist says. As many who have contracted the A(H1N1) virus can tell, if treated, the flu is not much worse than a normal flu. Of all of Europe, England has the highest reported cases of H1N1 with 7,500. Four people in the UK have perished from the virus. As for Ron Weasley and his alter ego, Rupert Grint, are currently premiering their Harry Potter and the Half-Blood Prince across the world while filming the final chapter in the series, Harry Potter and the Deathly Hallows. “He is looking forward to joining his fellow cast members at the premieres this week and will then return to filming directly afterwards,” Grint’s publicist adds. Reports say that Grint’s co-stars Daniel Radcliffe (Harry) and Emma Watson (Hermione) were never in danger of contracting the H1N1 virus.